I was asked the other day what I could recommend as a gift for someone going travelling. It took me a while to think about it as there are so many different ways people travel. I’ve come up with the following items that I think would be useful, for men and women, whether they are backpacking, cruising, sipping champers on a balcony overlooking the Amalfi coast, or riding festering buses in SE Asia. I’ve put luxury in quotes for a reason. If I was back home these items wouldn’t be on my luxury list, but when you’re travelling what counts as luxury takes on a whole new meaning. Examples are: a flushing toilet (if you can sit on it, even better), a shower that actually gets you wet and doesn’t hurt you, bedding that doesn’t have the imprint of the previous occupant, or their hair! I know, I’m fussy. I’ve read lots of blogs of people who travel (it seems) with nothing but a Lush solid shampoo bar. I’m afraid I’m just not like that. At home, I had a bathroom cabinet chock-full of moisturisers, oils, masks, cleansers, serums etc. I’ve struggled to leave that life behind, so I keep a little bit of it with me in the form of these products. There are other products I thought about adding, such as face masks, (despite my experience in Bali) but they’re not a luxury, they’re an essential! Below are three things I guess I could go without but choose not too, despite being on the road. 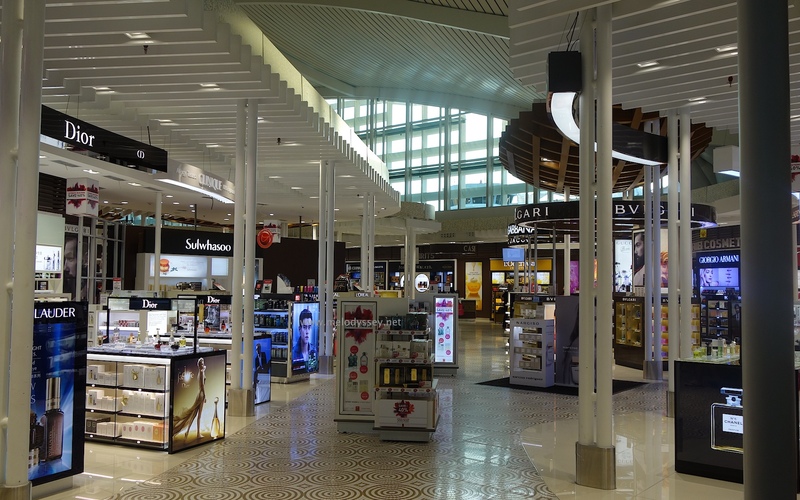 When you walk ‘air side’ at Bali airport you are suddenly surrounded by luxury products. It’s as if you’ve walked into a mini Selfridges beauty hall, with a handbag hall around the corner. It’s a sea of luxury. With few staff in the beauty section. Which is not a criticism. A sea of luxury, with barely a soul around. So not sure quite why I couldn’t take a decent photo of it. If you want something done, give it to a busy person. If you like pictures of food, random musings and travel rants, follow Melodyssey on Facebook. © Melanie Hayes and melodyssey.net, 2015. Unauthorized use and/or duplication of this material including images without express and written permission from this blog’s author and/or owner is strictly prohibited. Excerpts and links may be used, provided that full and clear credit is given to Melanie Hayes and melodyssey.net with appropriate and specific direction to the original content. © Melanie Hayes and melodyssey.net, 2014. Unauthorized use and/or duplication of this material including images without express and written permission from this blog’s author and/or owner is strictly prohibited. Excerpts and links may be used, provided that full and clear credit is given to Melanie Hayes and melodyssey.net with appropriate and specific direction to the original content.